« Go See – Buenos Aires: Louise Bourgeois’ “The Return of the Repressed” at Fundación Proa through June 19th, 2011. 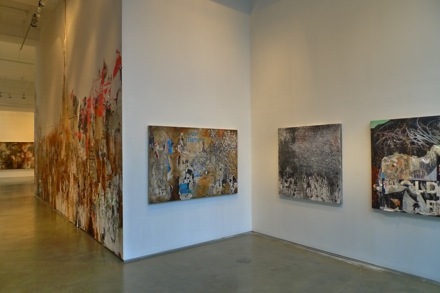 Installation view of José Parlá: Walls, Diaries, and Paintings at Bryce Wolkowitz Gallery. All images Nicolas Linnert for Art Observed. Entering into its final week is José Parlá’s Walls, Diaries, and Paintings, at Bryce Wolkowitz Gallery. It is the Brooklyn-based artist’s second solo exhibition in New York. For the show, the painter expanded his surface area from the canvas planes to include large parts of the gallery walls as mixed media installation. 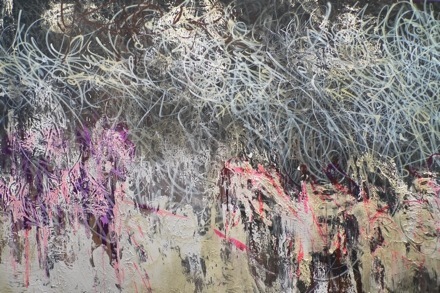 José Parlá, DeKalb Avenue Station (detail) 2011. 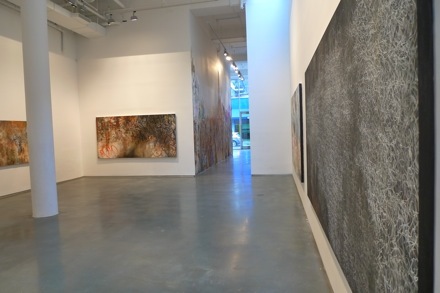 Installation view at Bryce Wolkowitz Gallery. Calling himself a “documentarian of city life,” Parlá sources his inspiration from the interpreted energy of the city. 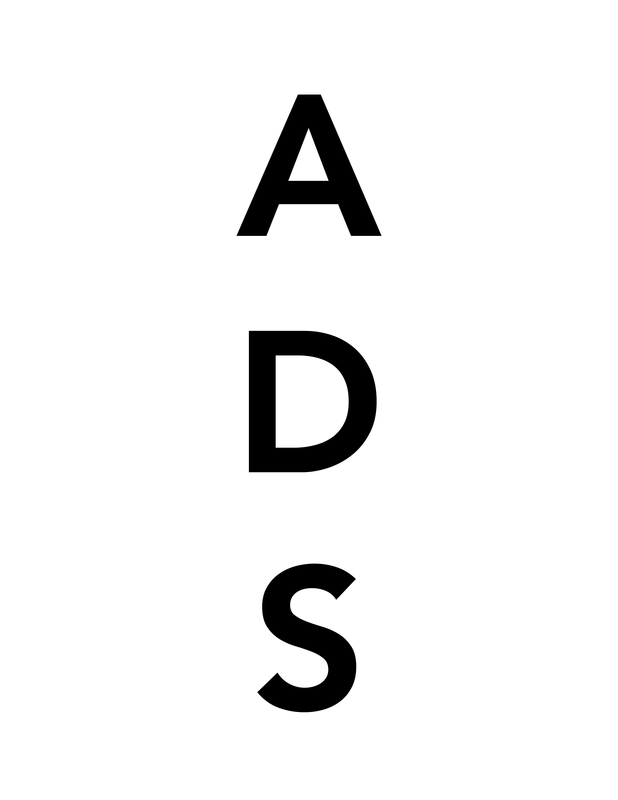 Much of the titles used for the artist’s works derive from some site-related experience-some are more specific than others. DeKalb Avenue Station is a clear reference to the Brooklyn train stop, while a work like If I Was Water, with its serial graffiti hooks that begin to resemble a stylistic Arabic script, could perhaps be inspired by the port city of Istanbul. 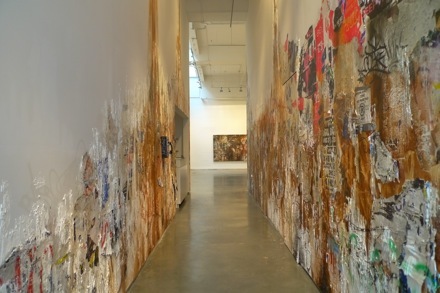 Fifteen paintings are installed on the walls of Bryce Wolkowitz gallery, and the space’s central corridor is covered in paint, graffiti, dirt, and various torn posters that otherwise belong on the street. 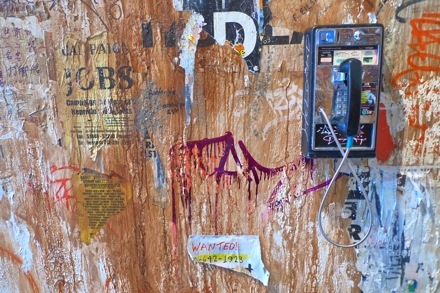 Adding to this wall installation is a coin-operated payphone that feels equally unfamiliar when picking up and holding to one’s ear as it is to receive the voices shouting in foreign tongues emanating from the heavy black handset. 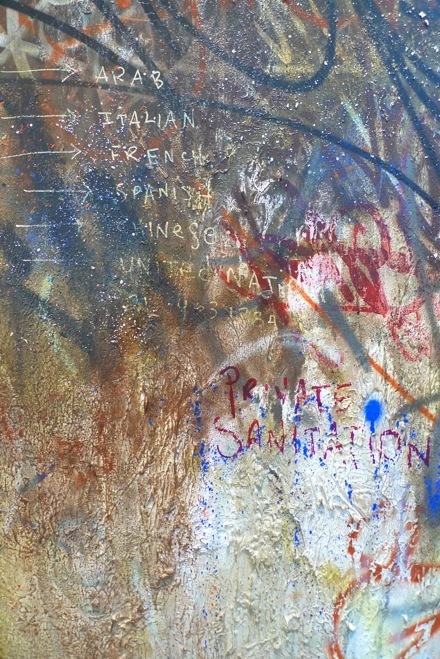 José Parlá, If I was Water (detail) (2011). Detail of José Parlá’s large-scale wall piece at Bryce Wolkowitz Gallery. Parlá, with his highly emotive painterly flourishes and thick, uneven mounds of acrylic on canvas, clearly takes as a point of departure the artistic oeuvres of Abstract Expressionists like Jackson Pollock and Cy Twombly. Although rather than retaining the painting’s significance as a dramatic dance of materials relating strictly to the individual, Parlá opens his visual dialogue with the shared community of the street. Making visible gestures that possess the traits of street tagging, the artist positions himself at the crossroads of the post World War II art movement and the collaborative graffiti practice that gathered momentum in the 1980’s and continued until very recently. José Parlá: Walls, Diaries, and Paintings closes on April 16. This entry was posted on Sunday, April 10th, 2011 at 11:06 am	and is filed under Go See. You can follow any responses to this entry through the RSS 2.0 feed. You can leave a response, or trackback from your own site.